HENRYK GÓRECKI (1933-2010): Genesis: Elementi per tre archi, Op. 19/1, NIKOLAI KORNDORF (1947-2004): String Trio. Description: Elementi is an early work in Gorecki's output, from 1962, when he was still very much part of Polish Modernism, and it sounds - disconcertingly, if your first thought on hearing the composer's name is the Third Symphony - very much like Pendereckian sonorism - somewhere between Threnody and the blisteringly aggressive solo part of the first Cello Concerto. The work is in fact strictly serial, but this is entirely subsumed in the complex, saturated surface texture. 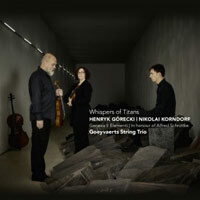 As befits an homage to Schnittke, Korndorf's trio dips in and out of several different styles. The first movement with its persistent, pedal drone-based pentatonic tonality on D, with scordatura tuning, incongruously evokes bagpipe music, slowly evolving in waves of close counterpoint. The energetic post-minimalist Toccata bursts in over this drone texture, finally allowing harmonic movement via a series of abrupt modulations, and expanding the rhythmic cell with which the movement opens, building increasingly complex textures and rhythms. The Aria begins with simple, canonic textures in diatonic harmony. During the composition of this movement, Korndorf learnt of Schnittke's first devastating stroke, and this is reflected in the music's abrupt shift into sad, keening, atonal mourning, increasingly obsessively concerned with an ostinato figure of a musical monogram derived from Schnittke's name. Goeyvaerts String Trio.